Hesed Shel Emet, Oregon's Jewish Indigent Burial Society, is more secure today thanks to the generosity of Min Zidell z"l. In December 2012, Mrs. Zidell established the first permanent endowment fund supporting this unique program. Hesed Shel Emet recognizes that all Jews deserve to be buried with dignity regardless of financial circumstance. The ultimate goal is for the program's financial needs to be met through endowment funds such as the one created by Mrs. Zidell. 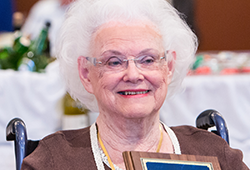 In June 2013, Min Zidell was honored at OJCF's Annual Reception due to her generosity toward Hesed Shel Emet. It was then that her daughter, Charlene Zidell, shared the motivation for her mother's gift with everyone in attendance. When Mrs. Zidell was seven, her oldest brother Jake, then 23, passed away. At the time, her family did not have the financial means to give Jake a proper Jewish burial. Mrs. Zidell wants no Jew in Portland to have to experience the pain and financial stress her family did when faced with the death of a loved one. The Min Zidell Hesed Shel Emet Endowment Fund of OJCF will make a real difference in the community's ability to care for those in need of financial support at the end of life.